Portland Mayor Ted Wheeler wants to hold steady within the Joint Terrorism Task Force. 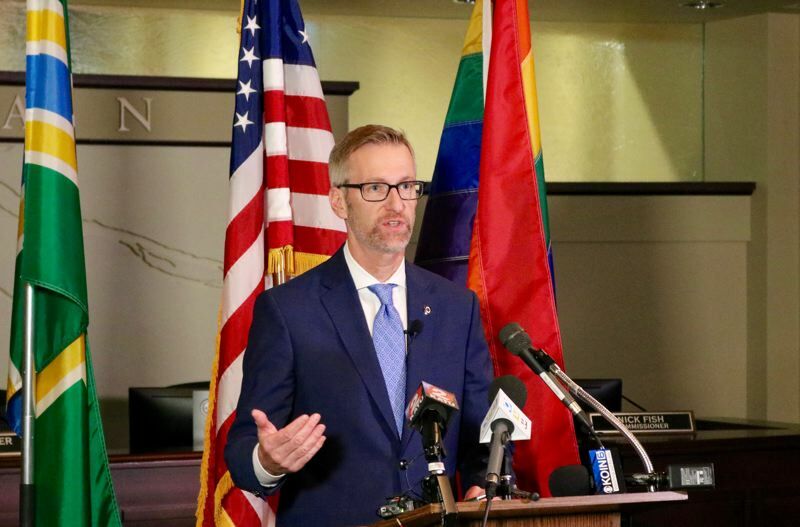 Portland Mayor Ted Wheeler is doubling down on his support for the Joint Terrorism Task Force. The Rose City has had an on-again, off-again relationship with the law enforcement group overseen by the Federal Bureau of Investigation. The city exited the local, state and federal partnership in 2005 but then rejoined in 2015. Many City Hall observers expect incoming Commissioner Jo Ann Hardesty to lead a charge to yank Portland out of the JTTF again, though it's hardly a foregone conclusion. Wheeler, for one, is holding steady in opposition. "We would be out of the loop on information that impacts the safety of people in our community," he said during his monthly press briefing on Friday, Dec. 14. Wheeler plans to discuss the proposed pull-out during a private meeting with Hardesty this month. He has met privately with FBI officials to discuss next steps if the city leaves the task force, but thinks the best solution is to solicit testimony from the public at City Hall sometime early next year. "It has long been my opinion that we should stay in the JTTF," he continued. "I would stay in the JTTF unless the JTTF gave me a reason not to be there." The Portland Police Bureau coordinated with the JTTF after "numerous" local businesses reported receiving bomb threats and demands for payment on Thursday, Dec. 13, part of a nationwide scare and email hoax. Officials said none of the local bomb threats were credible.